Engineering is in our name for a reason. It is no accident that Engineering in our name. It is the key element and foundation of our company in developing and providing effective solutions for our customers. Over 40% of our staff are engineers and highly-trained technicians that work in mechanical, electrical, and materials engineering applications for our customers' needs. Read on for a few examples of engineered solutions that have met our customers' needs. What do you need? Contact our expert staff today! A mining operation had a need for three phase electric actuators to control the flow of water in a separation unit. It was assumed that the vibration at the valve would exceed the limits of the ProMation Premium Controller's printed circuit board (PCB) assembly, so ProMation developed a solution where the controller PCB was located in a remote mounted Motor Control Center rather than mounted in the actuator. The Motor Control Center was fabricated with its typical motor starters, phase control, and relay electronics, along with the controller board. Each MCC and actuator combination was connected by custom built multiconductor pin and shell cable. A municipal water company approached one of our distributors looking for a solution for their multiple valve chlorine injector rebuild. 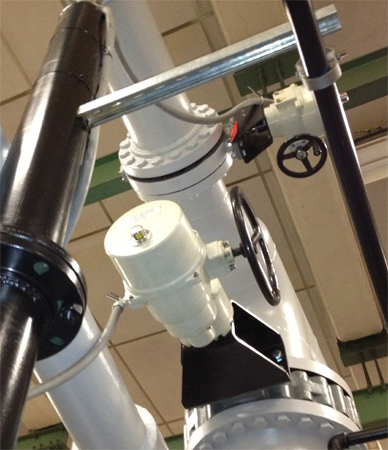 ProMation submitted a 450 in lb actuator and standard Local Control Station in 2012 for testing. Eighteen months later, the water company informed us that we passed the test, but wanted 800 in lb actuators and changes in the Local Control Station. ProMation Engineering worked with the engineering firm to propose materials and layout to achieve an economical solution for the new set of specifications. Fourteen P2-120N4 actuators with customized Local Control Stations were installed earlier this year (2014) and have been operating flawlessly since. A distributor contacted ProMation and inquired if we could operate a water valve for refilling dust suppression tanks from a two story tall copper mining truck. Upon further application discussions, we realized the truck operator normally needs to exit the cab and climb down to the refill station, which not only takes time, but creates a safety issue with personnel being outside their vehicle. We suggested using a wireless transmitter to activate a P4-230N4 (3,500 in lb, 230VAC on/off) actuator on the 8 inch butterfly valve. We offered two solutions for closing: a timer to shut the valve after a given amount of time or use the same transmitter to shut off the valve. The end user preferred to have the driver control the valve with a transmitter. ProMation delivered the P4-230N4 equipped with wireless electronics receiver and two button transmitter, to be mounted in the cab of the truck to operate the actuator. The end user has subsequently ordered three more transmitters for other vehicles. Rail and car tunnels require emergency ventilation fans and dampers that will operate in case of a fire inside the tunnel. Electrically motorized dampers need to close to isolate the fire and open to provide ventilation for those who need to exit the tunnel away from the fire. Some specifications call for actuators to control dampers after one hour at 150°C/300°F without use of external thermal barriers. Other specifications call for higher temperatures and longer times, but allow the use of external thermal barriers. ProMation actuators are rated to operate continuously up to 52°C/125°F. By using finite element analysis, ProMation was able to use the thermal characteristics of our quarter turn actuators to position heat sensitive, electronic control elements in different locations in the actuator housing to allow them to function properly after one hour at 150°C/300°F. We have also developed silicone coated ceramic blankets that allow the actuators to operate after two hours at 250°C/482°F. If you any questions or comments, please feel free to contact us at any time at 352-544-8436.